The 24x30 Clear tarp is heavy-duty and strong. Tarps are waterproof, treated to prevent rot, mildew and UV damage. All clear tarps are 6" less than their stated size due to hemming. 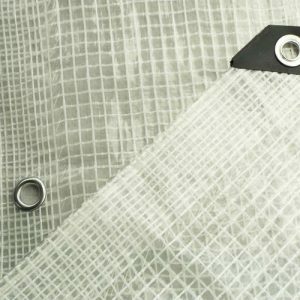 Clear tarps also have dense 12x14 mesh (weave) count, 12 mil thickness and 6oz. per sq. yard (1200 Denier) weight. Edges and corners are reinforced. Rust resistant aluminum grommets are spaced every 18". 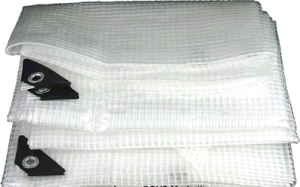 Additionally, clear white-string tarps contain strong threaded interior to prevent tearing.